Whilst this book is aimed at young folk (7-14) with its Wimpy Kid/graphic novel style, I think it would be extremely useful for people of all ages as it contains easily accessible information about the effects of all types of dementia. You don’t even have to have a relative with dementia as there will be someone in your neighbourhood with the condition and this book has a wealth of tips and advice which could really enhance the lives of those affected by dementia. Brie, Fred, Sarah and Sam give honest accounts of what life is like for their grandparents, anecdotes which are sometimes humorous, sometimes heartbreaking. There seems to be a lot of stigma attached to dementia, just like there was/still is with cancer and depression. Any book which acts as a springboard for discussion can only be a positive move forward and it is often the case that young people are more open and less inhibited in their views than adults. 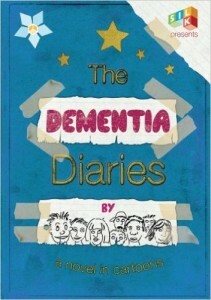 The Dementia Diaries should be in every school library. With life expectancy increasing, more and more children will experience dementia within their family circle and it really is about time we stopped considering it as something shameful to be swept under the carpet, “out of the mouth of babes” etc…. Highly recommended. My thanks to NetGalley for providing a free digital copy for review purposes.